With the Explorer Hotels holiday vouchers you will give the gift of one-of-a-kind experiences in the Alps! Apart from the comfortable twin beds, the Explorer Hotel rooms feature seating at the base of a panorama window. By deciding on green energy, the Explorer Hotel is officially a climate-neutral and zero-emission building. Bring your bike, skis or snowboard to the Explorer workbench and use the available tools and accessories to fix it. At the Explorer Wall you get information about the region and you can see the most beautiful pictures of the explorer guests. Hiking, skiing, sledging – all of that combined with a dash of sightseeing. Find out which of the nine Alpine regions are best suited for you and your family. Conference, incentive trip, or staff outing: we offer customised corporate events with professional assistance in Oberstdorf, Neuschwanstein, Bechtesgaden, Montafon, Kitzbühel, Zillertal, Hinterstoder and Ötztal. That’s why in our rooms we have more than enough storage space for your equipment. In addition, we have a ski and bike test centre that includes rentals, courses, a workbench and sports lockers – and great deals for athletes, too! 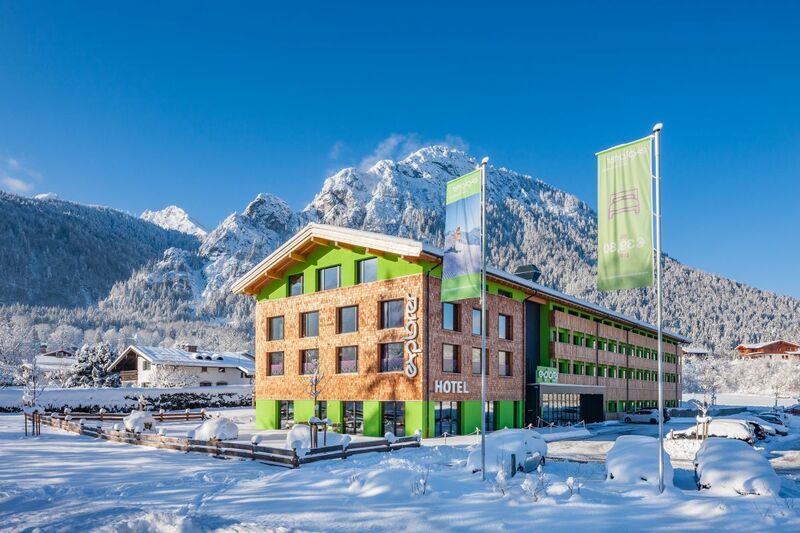 We are not only the first certified passive (zero-energy) hotel in Europe, but we are also climate neutral. That is truly unique in the hotel industry. However, for us, it’s simply a matter of course! The Explorer Hotels are situated in 6 of the top alpine regions. In Germany in Oberstdorf, near Neuschwanstein and in Berchtesgaden; in Austria in Montafon, in Kitzbühel, in Zillertal and in Ötztal. Our beds are extremely comfortable, the rooms are spacious and the mountain view is invigorating. The absolute relaxation highlight is our sports spa, which includes a sauna, steam bath, infra-red cabin and a fitness room. Everything we do, we do with passion and the highest level of commitment. For us, quality is not just a buzzword! We promise that you’ll always receive the best available rate and that you will meet Explorer Buddies who will be happy to advise you and who are just as crazy about sports as you. The Explorer Hotels are your location for being active in the mountains. The relaxed atmosphere, the modern design and the young team promise holiday-feeling for explorers. +43 5558 20 333 445. The Explorer rooms are functionally appointed with lots of storage space, hooks, shelves and closets. Jacket, gloves, glasses, backpack, helmet – even your notebook – everything has its own spot. Furthermore, each room has a large safe in which all of your things can be safely kept. Back from a trip into the mountains, you can relax in the hotel’s Sport Spa. The spa includes sauna, steam bath, infrared cabins and a relaxation area with comfortable recliners. The Explorer gym (38 m²) offers a great view of the surrounding mountains. Power up using the treadmill, cycle, stepper or skater! You can simply and easily rent equipment, book a course and use the Explorer workbench to wax your skis or your snowboard. Use the heated lockers to keep your skis and snowboard safe and dry. In the Explorer Hotel you kick off your day full of energy. From 7 to 10:30 am you can assemble your own breakfast by selecting from 70 fresh, high-quality and mostly regional ingredients. Tip: Whether you'd like your eggs scrambled, over-easy or hard boiled, or prefer it with bacon – at the egg cooking station you can do it yourself! Would you like to book more rooms for yourself or additional members of your party? Then simply call us on (for Germany) +49 8322 / 940 79 445 or on (for Austria) +43 5558 / 20 333 445 or send an e-mail to: info@explorer-hotels.com You will receive our offer in no time at all! Sei spontan und wähle einfach einen anderen Zeitraum. Nur zu diesem Termin Zeit? Die anderen Explorer Hotels haben sicherlich noch freie Zimmer. Alle freien Termine und Preise findest du weiter unten. Wir geben nicht auf! Ruf uns einfach unter Tel DE +49 8322 / 940 79 445 oder Tel AT +43 5558 / 20 333 445 an und wir schauen, ob wir nicht doch noch ein Zimmer frei haben! Nicht zufrieden? Wir suchen Dir ein anderes Hotel. Keine Vorauszahlung, keine Kreditkarte notwendig. Deine Daten sind bei uns sicher und verschlüsselt.